Meghan, Duchess of Sussex (C) arrives with her mother Doria Ragland (L) and Prince Harry, Duke of Sussex to host an event to mark the launch of a cookbook with recipes from a group of women affected by the Grenfell Tower fire on Sept. 20, 2018 in London, England. 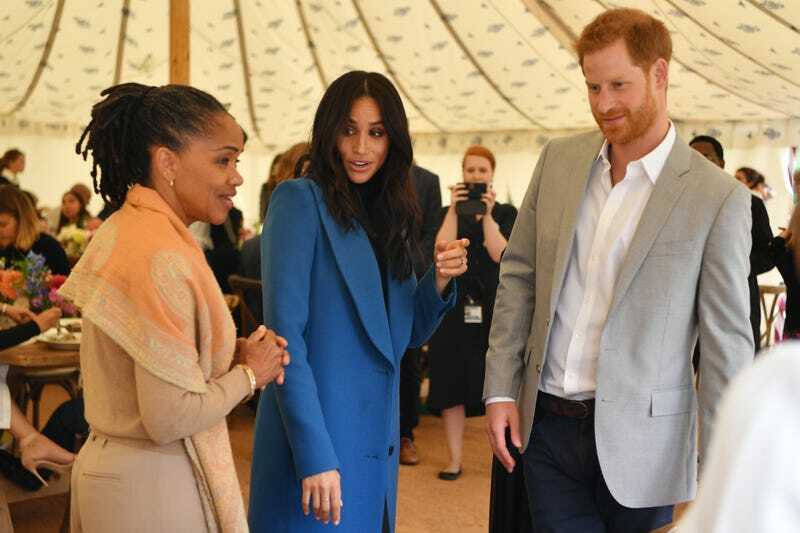 No shade to the bride, but one of our favorite aspects of Meghan Markle’s spring wedding to England’s Prince Harry was her incredibly elegant mother, Doria Ragland. And on Thursday, Ragland joined her daughter at Kensington Palace for a luncheon to celebrate the launch of Together: Our Community Cookbook, which she created with the women survivors of 2017's Grenfell Tower fire in London. It was the first time Ragland has been spotted in England since the internationally-viewed May 19 nuptials, but in the months since, she has been rumored to be moving to London to be closer to her only child. According to The Cut, she introduced herself as “Meg’s mom” as she helped the Duchess, wearing a black sleeveless turtleneck top and pleated black skirt under a fantastic cobalt blue coat by Smythe, prepare recipes of coconut chicken curry, aubergine masala, baba ganoush and chapatis. Meghan, Duchess of Sussex (C) jokes with her mother Doria Ragland (L) at an event to mark the launch of a cookbook with recipes from a group of women affected by the Grenfell Tower fire on Sept. 20, 2018 in London, England. So, to the women of the Hubb Community Kitchen, thank you so much for allowing me to be part of this adventure with you. I’m so privileged to know you. I’m so excited to see the projects you’re going to continue to do in your own community and the community at large, and also how you’re going to inspire people globally by sharing your stories and your recipes. It’s so impactful. You can see, just in a few days alone—and the book’s not even out yet—what you’ve been able to do. That’s a testament to what this means to people, and I’m so proud of you. Of course, since her engagement, the most visible members of Markle’s family have been her estranged father and sister, Thomas and Samantha Markle, who have been relentless in their attempts to leverage Meghan’s fame into gains of their own, much to the chagrin of the royal family—and many royal watchers. Thursday’s appearance by Ragland not only refueled rumors that she’ll be relocating (or has already moved) to London, but made it abundantly clear that she, unlike her ex-husband, is a welcome part of her daughter’s new life. While her future plans remain unconfirmed by the royal family, Harry looked on fondly at the two—and maybe stole a few samosas—throughout their afternoon together.